The Anchorage Village flag is up and a new Louvretec installed onto villa 15. Villa 14 showhome is now available for viewing. The Quadplex units are now completed with Louvretec and gardens installed. This month we welcomed the first two new residents into their quadplex villas and look forward to the remaining residents settling in this year. A roof shout was held on the 10th of August to celebrate the hard working team effort on the building of the new Quadplex villas and Villa 3. Everything is progressing well and the homes are on track for completion near the end of the year. The first 6 villas were completed in April and the residents have settled in. The landscaping is looking lovely and the community is taking shape nicely. 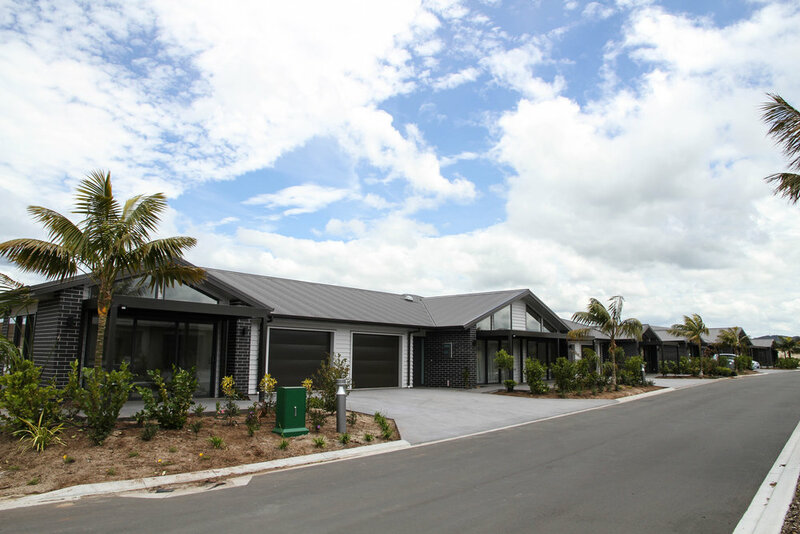 The stand alone villa 3 and quadplex villas 8 - 15 are under construction now and are due for completion prior to the end of 2018, just in time for the Northland summer. The first 6 villas were completed in April and the new residents moved into their villas. The site was blessed and the delighted residents are now into their new homes and community. Please check back here for regular news and updates.